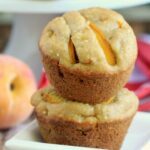 Browned Butter and Quinoa Peach Muffins - Frugal Mom Eh! Breakfast has always been a hurried part of my day. Even in the summer months I just get through it so I can start my day. Things don’t always go so smoothly with two little girls who enjoy playing with their food as much as they enjoy eating it. Breakfast can certainly get hectic in our household and I don’t imagine things will be any easier once they start school. One breakfast staple I love to serve are muffins packed with sneaky superfoods. The girls tend to wolf them down and we can all get on with our day. I love to eat my muffins with a little bit of honeyed butter spread on them. The problem with this is that it needs to be refrigerated which makes it less than easy to spread, even on muffins that are fresh out of the oven! I have a solution for that by making the honeyed butter with Gay Lea’s delicious Spreadable Butter products. 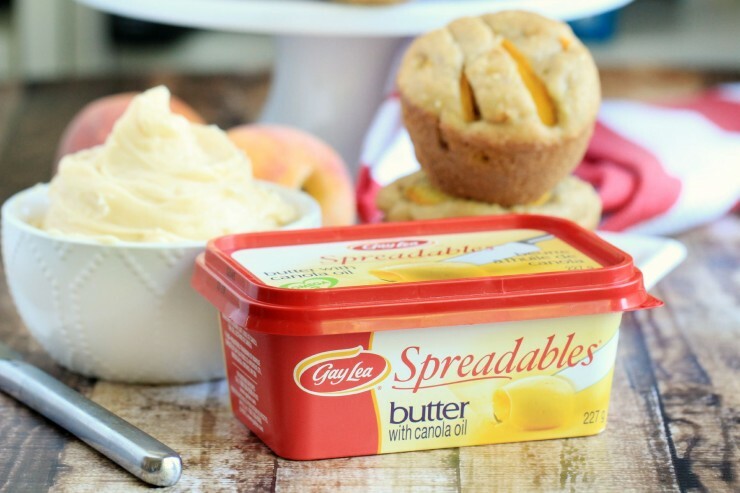 I wanted to share a great recipe using Gay Lea’s Spreadables Butter that will make School Mornings a whole lot easier (and delicious!) 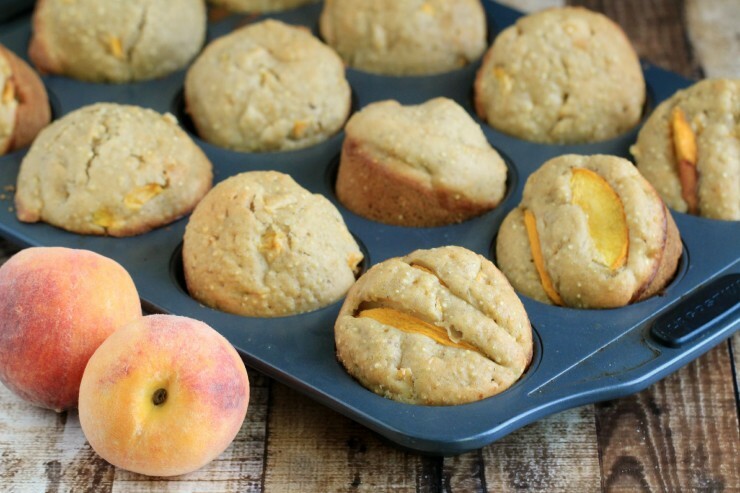 These Browned Butter and Quinoa Peach Muffins are great to pack away in a school lunch as they are packed with protein to help fuel their day. You will love the deep flavour the brown butter creates in these muffins, it’s honestly so rich tasting! butter right out of the fridge without preservatives. It’s also a source of 3. 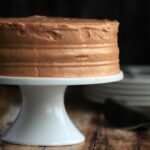 For this recipe you might even consider using the Light variety rather than Regular or even the Cinnamon Brown Sugar flavour for a nice change of pace! Preheat oven to 375 degrees F. Spray a muffin pan with nonstick spray. Set aside. Melt the butter in a medium saucepan over medium heat. Allow the butter to fully melt and cook down until it starts to brown and froth. It will brown fairly quickly so keep an eye on it. When little brown bits appear in the pan remove from heat and set aside. Whisk together the milk, egg and vanilla then stir in the brown butter until combined. In a separate bowl mix together the flour, sugar, baking powder and salt. Add brown butter mixture to the dry ingredients and combine well. Gently fold in the peaches and quinoa. Fill mufin tray so cups are 3/4 full. Bake for 20-22 minutes. Cool in pan for 5 minutes before transferring to a cooling rack. In a medium bowl whisk together butter, honey and vanilla until well combined. Scrape back into the Gay Lea’s Spreadables Butter container and refrigerate. Serve muffins with honeyed butter. Don’t forget to check out the Gay Lea website for more great recipes and information! 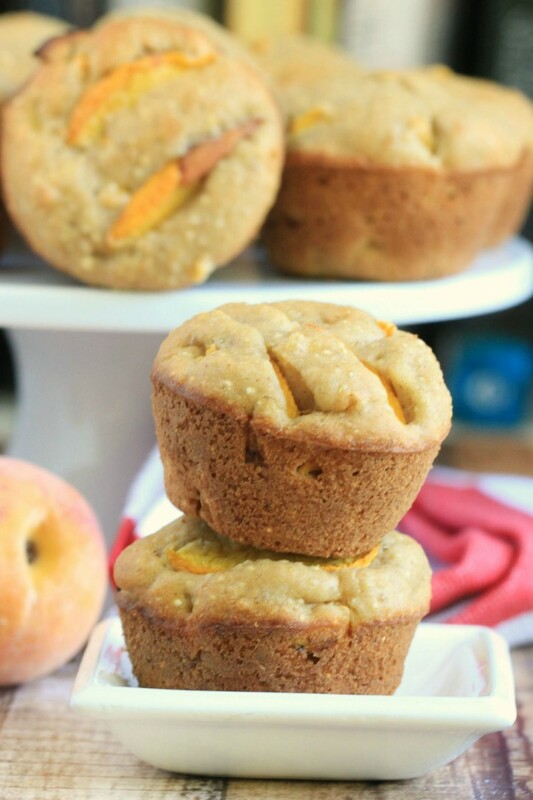 I’ve never put quinoa in muffins before, but these sound really yummy! Quiona is so good for you, I never thought of using it in muffins before. Great recipe. Now this is a great recipe, would go perfectly with my coffee right about now! I don’t think I’ve ever tried baking with quinoa…. Wow do these ever look amazing! I would love to make these for my kiddos. I’m sure they’d just love them! This looks like a lovely combination of flavors! And yummy, too! Fantastic photos. I’ve never known or thought you could use quinoa in muffins. These look great. I am going to pin for later! I have never cooked or baked with quinoa. Thanks for the recipe. Never thought to add quinoa to muffins. I must remember this. Those sound absolutely phenomenal. I would love to try those. These would be a ton of fun to make. Gosh, that combination sounds so good right now! Yum this sounds like a great combination. My daughter loves peaches. Those look really good. I would love to make these. These muffins look so good. I had no idea that you could use Quinoa as a dessert ingredient. Thanks for the recipe. My Quinoa recipe collection is growing! I’d love to make these muffins too. Oh my these look amazing! I really would love to have these for breakfast this morning! The muffins look delicious! I have never used quinoa. I would love to try your recipe. These look so delicious. I will have to try making these. I would not feel guilty eating them. I am currently looking for ways to incorporate more quiona into recipes, and this sounds perfect! I bet the peaches with the spreadable butter is melt in your mouth delicious! 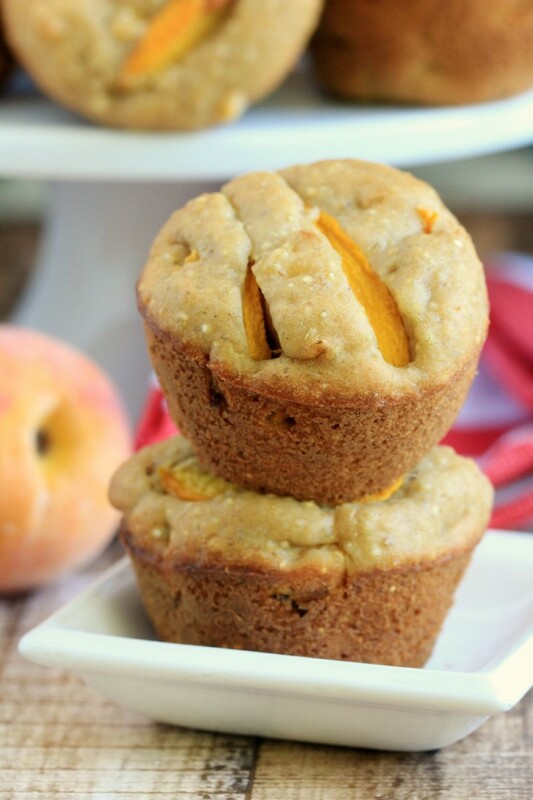 Brown butter and quinoa peach muffins would make a great breakfast snack for on the way out the door for the kids first day back to school. Wow! This looks like a really fancy muffin. I have never made muffin with quinoa before, but I love that you put it in. 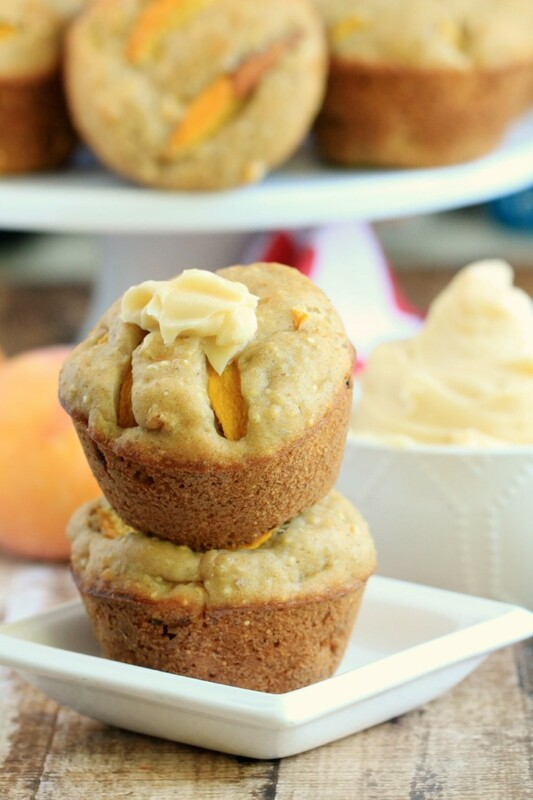 A peach muffin is awesome. Different, but I can see that it looks delicious. My goodness, these muffins looks absolutely yumm. The pictures are so inviting & I would really want to try this recipe right away. I am sure my husband & kids are going to love it. These really sound good, have never thought about including cooked Quinoa into muffins. Thanks for another great recipe to try! These look really good and I like the fact they have a higher grain protein in them. They must taste amazing. These sound delicious and extremely healthy…huge bonus! I’ve never had quinoa i will try this in the Fall thanks! I’ve tried quinoa a couple times in salads but never in a muffin before! 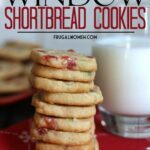 Good way to incorporate this healthy ingredient into something sweeter!